Along the road stand a ruined watch tower, a cabin and a small stable, all abandoned. Next to them lies a wooden tribune facing a list field. In front of the tribune, across the long rectangle of mixed sand and earth lies the large stone tomb of Lawrence the Brave, decorated with sculpted chivalrous scenes. Lawrence was an undefeated jousting champion. After winning against over fifty knights, rumors of him cheating appeared despite his reputation. His fame kept growing with each new victory, but he lost the joy of jousting when he felt sportsmanship left the lists. When he died, his last will was to build a list field outside the town for knights to train on, and for regular friendly tournaments to be organized on. It had to be set in front of his tomb, but on an accessible location, so that every knight could come by and joust. He also left enough money to fully man a watchtower to guard the place against bandits for twenty years. A small house for these men and passing knights and a stable for the horses were built next to them, all according to Lawrence’s wishes. The first two years were successful. However, no one came to joust after stories of a cursed knight haunting the jousting grounds arose. A soldier had seen a ghost appear on one end of the lists. Drunk, he didn’t think much of it, but a squire confirmed the tale a few days later. The jousting ground was soon abandoned, and its tower unmanned, against Lawrence’s will. Years later, Lawrence comes back as a ghost when he senses a worthy opponent on the lists. He appears on his mount on the other end and jousts as if he were physical, except that no harm is done to either cavalier. Instead, he knows who won each round and keeps track of the score himself, giving advice and congratulations, depending on the result. Even as a ghost, Lawrence is very skilled, and no one has won against him yet. As tradition would have it, he would pay his ransom by revealing to the winner where he hid a part of his money before dying. The most important consequence of his defeat would be that his soul could finally rest in peace, as it would prove that he was not invincible, and that he wasn’t cheating. This location does a great job of tying its history to its function. It makes a lot of sense for a champion jouster to request a list field near his tomb. There is a note of tragedy accompanying the creation of the field, reinforced by the presence of Lawrence’s ghost. You mention cheating, but you don’t go into detail about the particulars. I get the idea people saw him as invincible, perhaps as the result of enchantment or a deal with fell creatures, but I’m filling in the gaps. Other than a relatively benign ghost, there is no sense of threat in this location. You have a hook in Lawrence, whom the PCs can put to rest by defeating him in a joust, but I feel like you need something more to challenge the PCs. For example, perhaps one of his detractors has also risen as a vengeful spirit and sabotaged the field. The map very clearly represents a list field with a set of stands for onlookers. It looks like you covered every detail for a list field, down to a stable and a lance rack. The watch tower is in disrepair according to the map and you indicate this fact in the text, but you should have shown the unmanned tower falling into its ruined state after people abandoned the field. The tomb seems small for a decorated champion, so it needs to be larger or you need to show some indication of Lawrence’s humility to explain the tomb’s modest size. The text is relatively clear. You use some passive voice, and I came across some clunky sentence construction in a couple of places. Overall, you have a unique (at least to me) location in the haunted jousting grounds. It needed more than the simple hook provided by Lawrence. More conflict, perhaps driven by the rumors of cheating, would have helped to make this a more compelling adventure location. I cannot recommend this to advance. A jousting ground is a really interesting setting for an adventure. I think nothing screams medieval adventures anymore than a good joust, yet it's not something I recall seeing in too many adventures. I think the location does a good job trying to take what's usually a fairly standard locale and trying to inject some mystery into it. I wish it had pushed a little further, however. I want to see more than a single ghost here, as this right now feels more like the location of a side quest than something that could hold down a full adventure. I wonder if it could have a full "Field of Dreams" type of scenario here? Even without going that far, saying no harm befalls the mortal competitor when he/she jousts with Lawrence takes a lot of danger out of this location. Speaking of which, let's talk about the Lawrence's name. People have different things they look for in naming, but Lawrence feels very prosaic to me, evoking an older relative or acquaintance, not high fantasy. For the map itself, I think it's clear what's intended and could easily be reproduced, but I think it has some failings. To start with, everything feels very blocky -- all the buildings are very simple rectangles, which isn't how most buildings are constructed. Even the debris falls in block-shaped angles, when it should just be a general fall (there are softer edges on the list itself, so it's not just an element of the illustration program). In general, as with the write-up, it just needs a little more magic -- some more exciting buildings, perhaps a mausoleum/museum memorial instead of a simple tomb -- to really drive home the potential of this location. It also has one of my bugaboos when it comes to maps -- the compass has due north pointing off to the top-left. Unless there's a specific/important reason north isn't "up" on a map, that's the easiest way to align it, as most people are going to default to calling it that anyway. I like the idea of this location a lot -- any group that has a classic knight type of character in it should be able to have some fun/memorable moments with an encounter at a haunted list -- but I think it falls short in execution. As such, I'm afraid I'm on the fence for this entry. Congratulations, Nikolai. Putting yourself out there to compete in anything is hard, and designing RPGs is hard. Particularly designing adventure settings or locations. You have to be able to suggest some ideas about personalities, plots, terrain, and more, and have GMs chomping at the bit to add your location to their regular game. Let's see how you did! I believe in positive feedback and honest criticism that should make you better at every part of this gig. So to start positively, I want to say that a haunted jousting grounds gets my attention. Although I prefer larger regions for adventure ideas, this simple area can fit neatly into any setting or be outside any city, and that means instant side-trek adventure. The map is serviceable—a cartographer could certainly take what you submitted and make it a compelling map that GMs can use. Now for the hard part: your prose contradicts itself. The guy dies, then has a tournament held for two years, then people stop coming, THEN he shows up as a ghost, and doesn't hurt anyone. He just pats challengers (who never win) on the back and gives advice. As a single encounter there could be a half hour of adventure here as the poor cavalier player who never gets to take his horse underground finally beats a legendary figure and gets directions to the ghost's treasure. But there's no drama and the stakes are incredibly low. It's the flag football version of Pathfinder. So my advice to you is to think bigger. Even a little side trek encounter can have something riding on it. Good jousters hurt people. People are speared or crushed by horses or they fall and break their backs. Having the ghosts of those who died after challenging Lawrence in the stands might be a neat touch. Having to speak to or free them is creepy, and maybe you have to beat Lawrence to get the info you need for something else. I've said it before. Many of these entries have potential but leave me filing in the actual adventure. You don't have an adventure location. You have a location. Where no one ever gets hurt. If you move on in this contest (or in future contests or design work) I encourage you to think bigger. And go ahead and kill some PCs with your work. Really. They want you to. Well done on making it through Round 2. You've shown you can pull through when time is an issue. 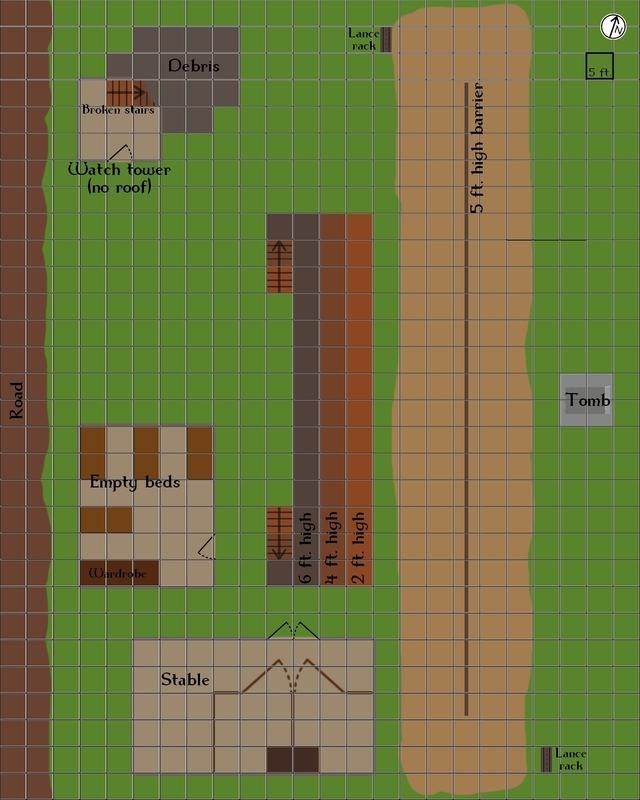 First, from the standpoint of being submitted to a professional cartographer for cleaning up, your map is very clear on locations, sizes, and objects. I can't imagine any cartographer having problems designing a professional adventure map and location from what you have here. You've accurately indicated the debris from the ruined watchtower (I don't mind that your version seems blocky or square), that just makes it so the cartographer knows which tiles on their version should have debris and rubble and they can illustrate it as befits their art style to indicate a hindered terrain square. Second, from the standpoint of having an exciting or adventurous encounter here, the layout and story really leaves only one logical type of fight or encounter here, and that's Sir Lawrence's encounter. I could put bandits in the cabin or watchtower waylaying people, but would Sir Lawrence allow such a thing (assuming he could leave the tomb list area momentarily)? At it's base, you have a location for an encounter. It's clearly labelled and believable, but it doesn't seem adventurous or exciting beyond a role-playing encounter with little risk of injury. I might have made some alterations or additions myself. Maybe a well near the cabin or an official's box or viewing seat, either in the center of the stands or on the other side near the tomb, for a local mayor or official to watch from. If I did that, I would likely have offset the tomb a bit to the north, though its current location would fit with giving Sir Lawrence a 'seat of honor' for viewing by having it right before his tomb. Realistically, I think it still feels a bit weird having it right there front and center, since having your spectators and participants constantly reminded of mortality (rather than glory and conquest and competition) can be a bit off-putting. More believably, there would be a statue of Sir Lawrence looking over the list and his tomb would be in a slightly more offset and secluded spot nearby (on the map or off.) As it currently stands, the tomb has no details or apparent effect other than housing Sir Lawrence's body or possessions. While I don't tend to need backstory or require it too heavily for my critiquing here, I do have some opinions on the history of the location you've provided. One, we know Sir Lawrence paid for 20 years of fully manning the watchtower. Since we have no indication of anything preventing this, ie. war wiping out the knights or group he paid, or some disaster knocking down the tower and it not being able to be repaired (which seems hard to believe), we have to assume that it's been after 20 years and it's otherwise fallen into ruin and neglect so badly it's collapsed to the extent you've illustrated (yet the cabin and stands and tournament field itself has not). Since there were two years of tournaments, that means that over 18 years have passed with little to no real interest in this location. I don't know about you, but if I were to take a room of 10 random jousting knights and mention a tale of a cursed knight haunting a list field just off a road, I can't imagine there'd wouldn't be at least one who would go and check it out, at which point, the tale of Sir Lawrence (or at least a jousting ghost) who didn't injure or harm his opponent wouldn't make the rounds and become a highlighted area for visiting and aspiring knights (or those seeking Sir Lawrence's treasure). Since there's no indication of why there wouldn't be inhabitants or locals or travel nearby, we would have to do most of the gap-filling ourselves. It's also a bit of a shame that the tomb has so little bearing on the location despite its prominence. Is it a simple one room mausoleum or does it lead below, to what could be a series of rooms depicting Sir Lawrence's life, victories, and accomplishments, possibly with traps for tomb-robbers or access to underground tunnels from burrowing creatures that dug into the tomb long ago while expanding their lairs?